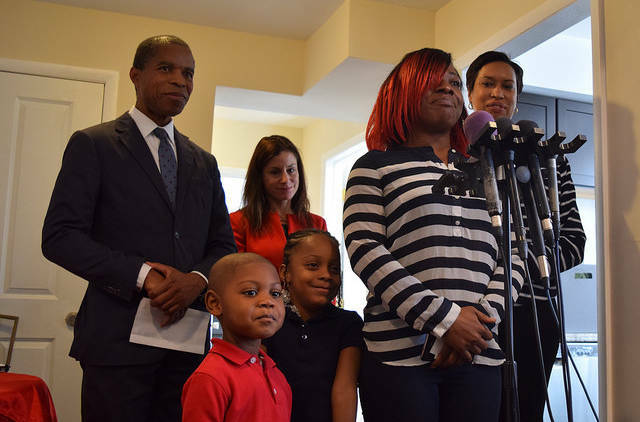 On Nov. 20, in the company of her two children, Mayor Muriel Bowser, D.C. Department of Human Services Director Laura Zeilinger, and a half-dozen news cameras, Tremaine Anderson signed a two-year lease for her family’s new apartment. Anderson became homeless after she had her first child. Over the years, she has stayed in D.C. General Family Shelter, at her mother’s house and couch surfed. None of it helped change her trajectory. Until now. 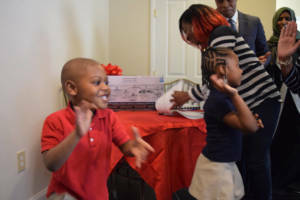 This was the 72nd lease signing of DHS’s Home for the Holidays campaign, an effort to move 400 families and individuals into permanent housing by Jan. 15. Bowser spoke about her administration’s focus on transforming the city’s homelessness services system, including “exiting” people into safe and affordable housing. According to Zeilinger, Mayor Bowser and the D.C. Council have appropriated unprecedented resources to help people exit homelessness. The mayor spent the first week of October announcing such investments, culminating in a briefing for the landlord community at the Wilson Building. There, the mayor announced a new public/private “mitigation fund” to assure landlords that working with families exiting homelessness in the District would be good for their business. The fund essentially insures landlords up to $5,000 for excessive damage or unpaid rent lost to formerly homeless tenants. On balance, partner landlords would be expected to look beyond an eviction history or poor credit to give someone who has been trapped in a cycle of homelessness an opportunity to find stability. As Street Sense Media has previously reported, common stereotypes landlords hold include that homeless lease-seekers will be bad tenants, destroy property or be evicted after a short time. The Department of Human Services has been working diligently since at least 2016 to find partner landlords who are willing to lease to formerly homeless individuals and families in a high-demand market where another tenant is usually not hard to find. The mitigation fund is a concrete demonstration of DHS’s commitment to their landlord partners. Don Gladstone, Anderson’s new landlord, heard the mayor loud and clear. Separate from the insurance fund, landlord partnerships include subsidies and supportive services for tenants, such as case management, according to Zeilinger. DHS provides short-term rent subsidies through its rapid rehousing program and long-term rent subsidies through permanent supportive housing placements. There is also a new flex fund to help rent-burdened tenants that need an extra hand. Tremaine Anderson works three part-time jobs and is seeking full-time employment. The arrangement set up by DHS allows her to privately contribute an affordable amount to the D.C. Housing Authority while DHS subsidizes the rest of her rent. Gladstone will receive a single check from the housing authority. Zeilinger explained that DHS is supporting the Anderson family with housing so that they can increase their earnings to maintain the cost of rent in the long run. 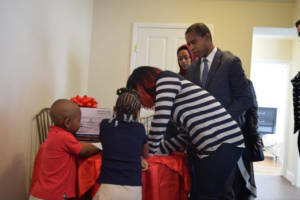 When asked at the lease signing about the impact of the Home for the Holidays campaign, with 7,000 people experiencing homelessness in D.C., Bowser said that her administration’s efforts over the last three years have been effective in reducing veteran and individual homelessness and improving prevention services. However, she acknowledged the great need for affordable housing beyond the pace of what government and nonprofit actors can build. This campaign is working with the private sector community to make housing available to people exiting homelessness with the assistance of the city. Video report by Reginald Black.